A couple weeks ago we announced the exclusive bags from some of our favorite brands to celebrate the new main handbag floor at Bergdorf Goodman. 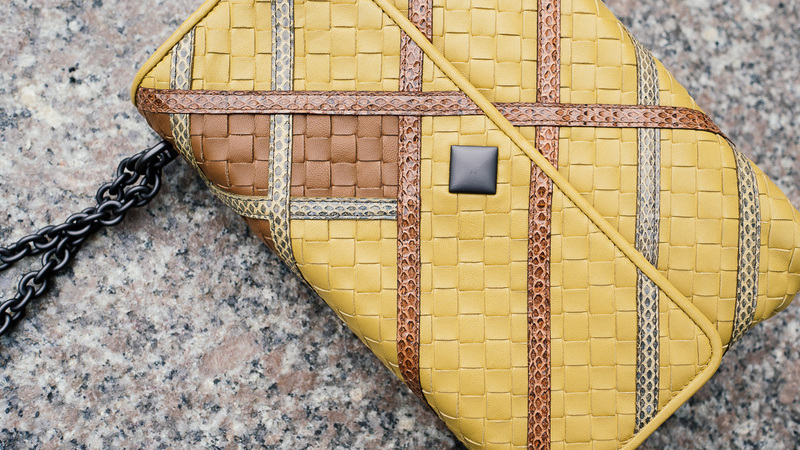 One of the standout bags of the range came from one of my favorite designers, Bottega Veneta. 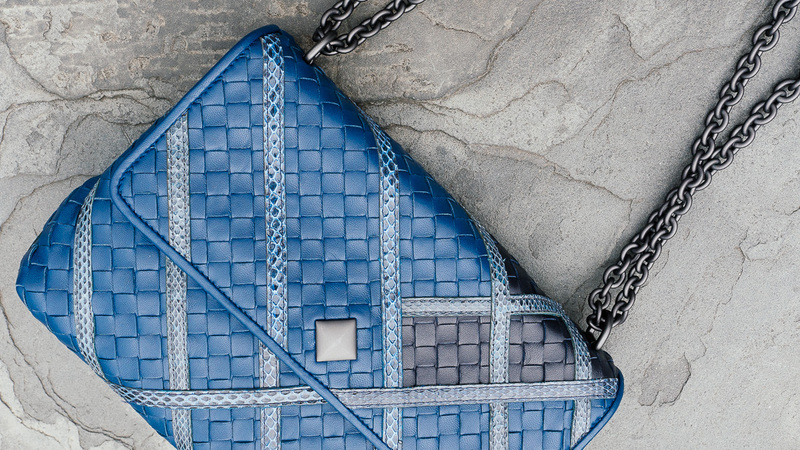 The exclusive Bottega Veneta Olimpia Bag, designed for Bergdorf Goodman by Tomas Maier, deserves not only a closer look, but also more details; it is probably one of the coolest designs I've seen in a while. On first glance, you may think this is just a bag with a few additional design elements, but once you hear the backstory, things get more interesting. Bottega Veneta opened up a brand new space on the handbag floor at Bergdorf Goodman. and this bag highlights a map of Manhattan. 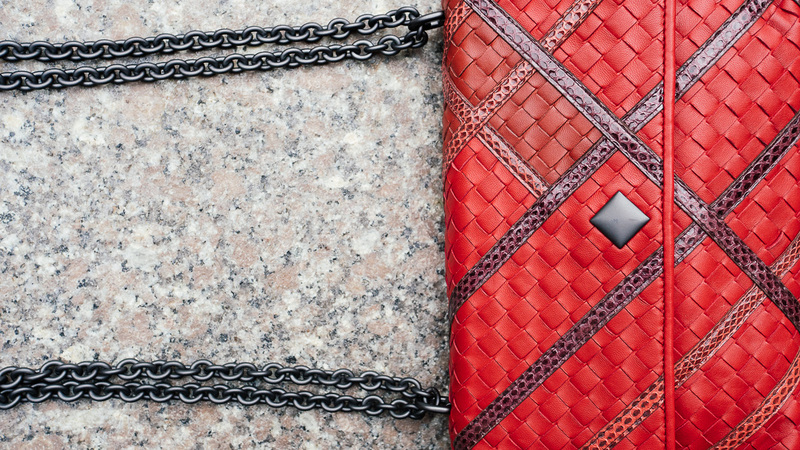 The clasp is meant to be the Bergdorf Goodman store, and the streets are denoted with the snakeskin details. 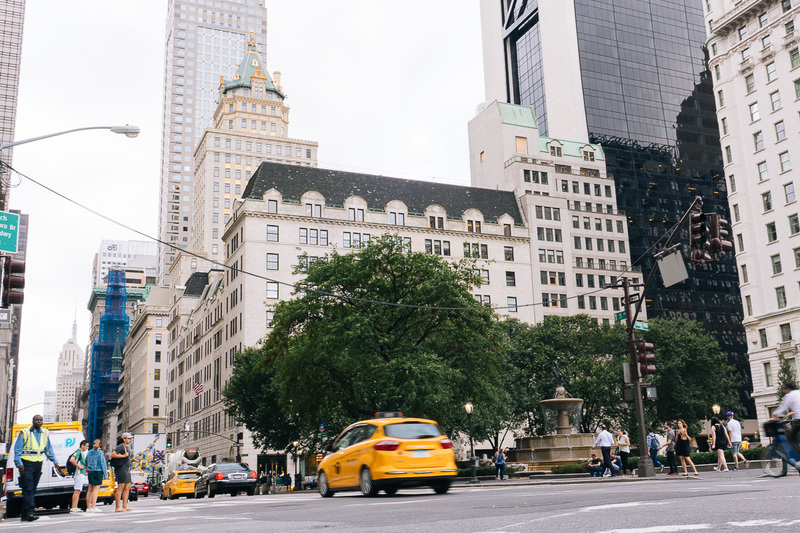 The solid, darke rectangle represents Central Park, where Bergdorf Goodman its on the southern border. 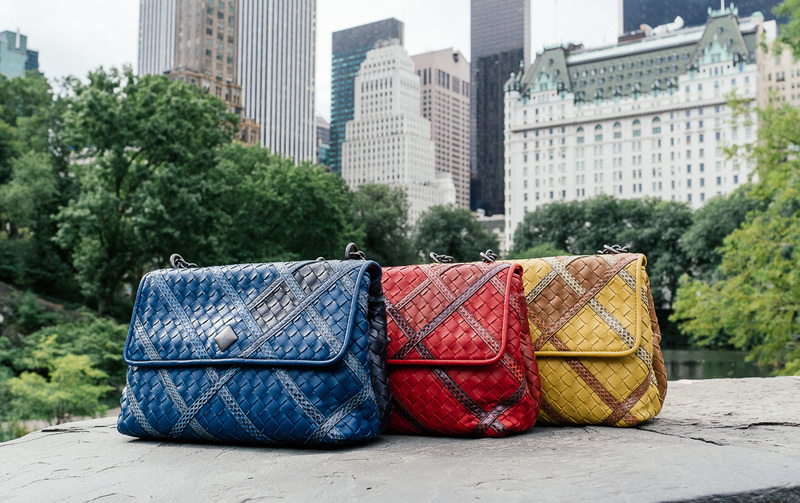 I love the way this bag was creatively planned; it's both very Bottega Veneta and very New York. The design elements that tell the story of New York don't distract from the beauty of the craftsmanship of the bag, and in many ways, they feel like a secret only you know, until you share it with others. This bag is available in new colors (I think the dusty rose is my favorite): China Red, Dusty Rose, Helios, Pacific, Fume New and Espresso. As this bag is exclusive to Bergdorf Goodman and a limited edition, so snap one up before it sells out.Price is $3,500 via Bergdorf Goodman and you can buy each version here: pink, yellow, black, red,blue, and gray. An exclusive craftsmanship and contemporary elegance, please meet the Bottega Veneta Monalisa Glimmer Tote Bag. Meticulously handcrafted in a harmonious combination of ‘Washed Fume’ and ‘Smooth Nappa Leather’. The intricate panels have been offset by the striking Intrecciato inlays and contrasting panels with hand applied, with graduated shading to make each piece an unique work of art in its worn right. It’s available in several delightful colors, completed with adjustable leather carrying straps, a roomy and functional design. And you will love the interior as it can store so-much more than your daily essentials, ideal to carry for work and for the weekends. It comes with an internal zip pocket, mobile phone compartment and coordinated mirror. Measuring 21 x 30 x 39 (D x H x W) cm. Bucket bags and backpacks were really not famous two years ago but recently, they are becoming the holy grails of bags. Knowing its demand in the fashion market, Bottega Veneta thought of creating their very own version of the bucket bag in the form of the Intrecciato Nappa Bucket Bag. What’s surprising about this bucket bag design from this Italian luxury powerhouse is that it has the feminine soft pleated sides, a smooth leather drawstring with metal loops and chain. Women can also choose among its four colors: peony, vesuvio, pacific and nero. The charming color selection will make it hard for its customers to choose just one. This bucket bag also features functionality with its double handle and adjustable shoulder straps thus making it perfect to wear cross-body or just over the shoulder. It measures 28′ x 24.5′ x 14.0′ (W x H x D) cm and comes with a price of $3550 USD or €2950 euro via Bottega Veneta e-store. Bottega Veneta has done it again. This is such a special and truly unique bag that represents everything the house has to offer, from authoritative detailing to expert workmanship to obvious beauty. The use of intrecciato is nothing new, to say the least, but the Olimpia has something really remarkable going on: double rows of different weaves, as well as perfect, knot-style stitching nestled in between those two symmetrical portions of weave and the center panel of glossy python. Bottega Veneta is an interesting brand that’s suited to match your taste for the unique and exquisite…and with that being said, we bring you the Intrecciato Nappa Messenger Bag, a one-of-a-kind piece that you should watch out for! We’re totally eyeing this piece, that’s a guarantee. Compact and highly versatile (as we quote the makers of this lovely piece), this mini-messenger is very impressive – imagine having the functionality of a wallet and sleek design of a handbag in one! Crafted in iconic Intrecciato in lambskin, we’re pretty sure you’ll be swooning over this luxe find. Inside, it has two functional zip compartments, an easy-access external pocket, and three credit card slots. We don’t know about you, but this nifty piece just broke the record. Measuring 20cm x 11cm x 6cm (W x H x D), you can get your very own Intrecciato Nappa Messenger Bag for $1,350 USD or €1,100 EUR via Bottega Veneta e-store. Bottega Veneta is famous for its intrecciato artistry, done with sophisticated artisanal techniques. And if we ever need the ‘perfect’ clutch bag, take the Bottega Veneta Ciel Intrecciato Glimmer Knot, a classic piece from the house. The design is timeless, but for the newest edition the fashion brand added an innovative glimmer accents, to give the knot bag a luxurious and contemporary edge. Truly an artful piece, the front looks like it has been ripped diagonally from the top right to its bottom left. This impeccably crafted piece has been offset by hand-woven panels of iconic Intrecciato and finished with shimmering ayers leather, carefully put together to give each separated piece a unique look and texture. Made from lambskin, measuring 6 x 10,5 x 17 (D x H x W) cm, priced at 1700 euro’s, via Bottega Venetae-store.